The installation “Invent a Smile” arises from Instamission, a project of collaborative photography using the Instagram application, made for the iPhone. Since early 2011, 21 missions have been launched, mobilizing the community of users around themes such as a song, an object that tells a story, a kiss, among others. Until now, this picture archive, that has more than 5,000 images, was restricted to Instagram and to the project’s fanpage (www.facebook.com/instamission). 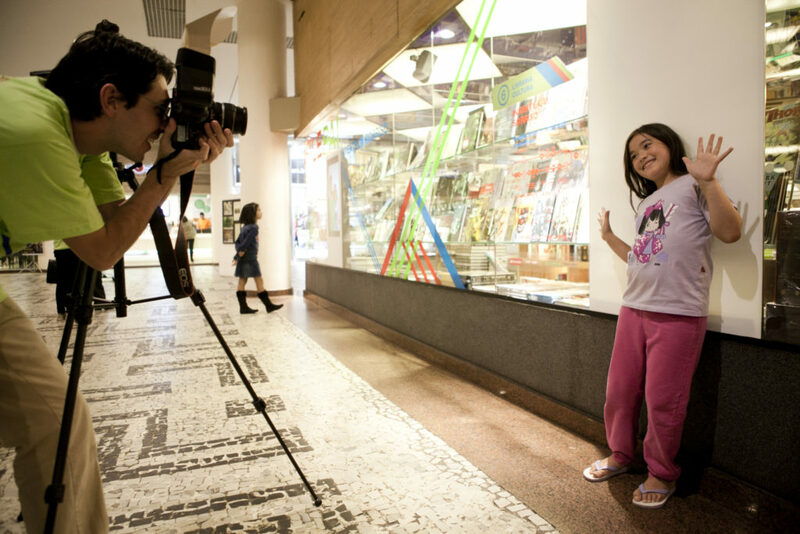 File 2011 is the first opportunity of disseminating those participations in the city of São Paulo. Transposed to the street, Instamission transforms into a cabine, where anyone is invited to invent a smile. Not the frozen smile of the traditional automated booths, but a spontaneous, maybe funny, maybe contrained, maybe even posed, smile. Anyway, made freely in the privacy of the mini photo studio. After capturing the portraits, it’s time to publicize the mosaic of characters and experiments. What until then was restricted to the virtual community or to the cabine’s interior, now gains a window at Cultura bookstore, in Conjunto Nacional, in loops of images continuously exhibited from monitors. The simple desire of portraying smiles ends up by creating an interesting mirror in which, on one side, the portrayed invents him or herself. On the other side, the passing public may meet those people, admire them and decide that they also want to participate in this movement. Daniela Arrais and Luiza Voll are partners at Contente, a company of special projects for the internet (www.contente.vc). Daniela Arrais, born in Recife, 28, is a journalist and keeps Don’t Touch My Moleskine (www.donttouchmymoleskine.com). She presently works for Folha de S.Paulo. Has worked for magazine Joyce Pascowitch, portal Oba Oba, Jornal do Commercio and Folha de Pernambuco. Is a collaborator in magazines as Criativa, Galileu and Continente Multicultural. Luiza Voll, born in Minas Gerais, 28, is a publicist and interaction designer. She lives in São Paulo after a period of one year in Barcelona, where she specialized in interaction design from the Vostok Program. Has acted in advertising agencies and design consultancies in Belo Horizonte, São Paulo and Barcelona, for clients such as Google, HP, Unilever, Natura, UOL, Adjuntament de Barcelona, La Caixa, Ikea, C&A, Red Bull, Pepsi.